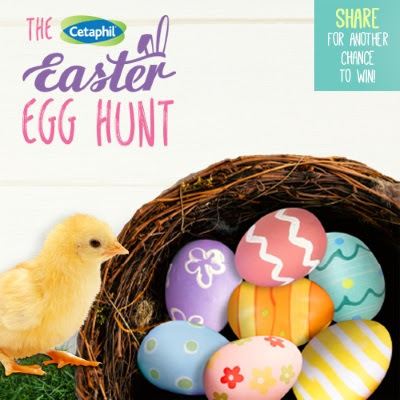 Cetaphil's Easter Egg Hunt is live! Look for hidden eggs on the Cetaphil website for a chance to win a Cetaphil Easter Gift Basket (valued at $210), consisting of $60 worth of Cetaphil products and a $150 Amazon Gift Card. Please note, the hidden chick is another entry and there is no clue for that, so you have to look around for it. The Cetaphil Easter Egg Hunt runs Friday, March 18, 2016, 9:00 a.m. ET, until Friday, March 25, 2016, 9:00 a.m. ET. I will be posting this everyday on our Facebook Page, so be sure to look to see there if anyone posts that they've found it! Also, they are running a separate giveaway on the Cetaphil Facebook Page for this contest too, with draw for your choice of 3 Cetaphil products and a $50 Amazon Gift Card! click here to enter that. Got the eggs easily, the chicks are harder to find.